CubaDupa is coming again and Capital! Steampunk will be there in splendidness, parading, tea duelling and – most important – racing teapots. The festival dates are 24-25 March – check the CubaDupa site for the full programme. The teapot racing is currently scheduled for 3.30pm on Saturday 24th (we’ll let all the registered teapot owners know if that changes, but it should be pretty firm). As with last year, the venue is expected to be Dixon Street, outside the Dixon St. Deli. 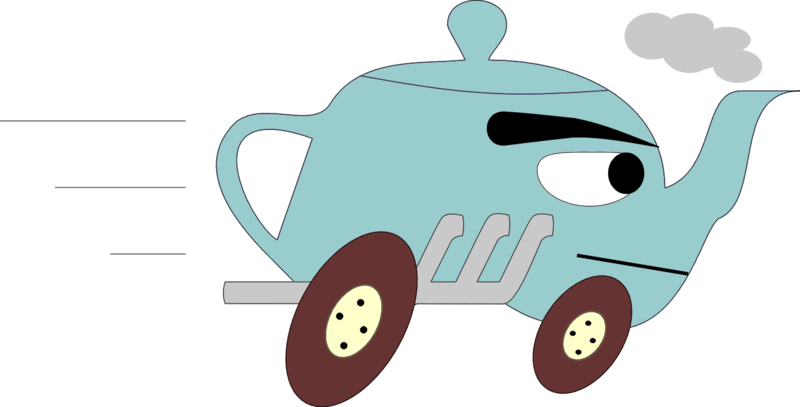 If you’ve raced a teapot before, you know how it all works. Fill in the registration form with details of you and your teapot and we’ll confirm time and place nearer the day. We plan to give you a race number before the day so you’ll know roughly when you’ll be performing, but we’d like all teapots at the course by 3.15 on the day so they can be on display in our pits area. If you haven’t raced before – how about making this the year that all changes? The rules are simple (and very flexible, if the judges are suitably bribed). The only rule that really matters is about the size of the racing teapot, so you can be confident it will fit through the obstacles. We can also offer some construction tips if you need them. Along with ‘normal’ teapot racing through the obstacle course, we’ll try to fit in some Teapot Sheepdog Trials. A new feature this year will be the availability of a couple of ‘have a go’ racing teapots. They’re basic, but they’ll get round the course without too much trouble and give you an idea of what can be achieved with a simple, relatively cheap base vehicle and a minimal amount of decoration. We’ll set aside some time during the racing for a (limited) number of people to try out our splendid sport. Contact us if you have any questions. And may the best teapot win.